Columbia Audubon Society's mission is to preserve the natural world and its ecosystems, focusing on birds, other wildlife, and earth’s biological diversity. We pursue these goals through education, birding and nature study, and habitat restoration. CAS helps people enjoy and learn about birds, and we help teachers educate students about nature and biodiversity. We are restoring a prairie at the Columbia Audubon Nature Sanctuary so Columbia residents can experience nature in their own backyard. CAS funds and hosts an annual field trip so 1,000 2nd graders can learn about nature while in nature. We fund tuition for 2 teachers to attend a National Audubon science camp, and scholarships for 2 students to attend the summer Teton Science School. We wanted to pass along this "thank you" we received from Rebecca, after she participated in Columbia Audubon’s annual Band with Nature field trip for second graders. Many thanks to everyone who has already contributed to Columbia Audubon during the 2018 CoMoGives community fund drive. If you haven’t contributed yet, you have until Dec. 31 to donate at www.CoMoGives.com and help us reach our goal. Maybe this picture of a red-tailed hawk will inspire you. It was drawn by a second grader who attended the annual “Band with Nature” field trip. 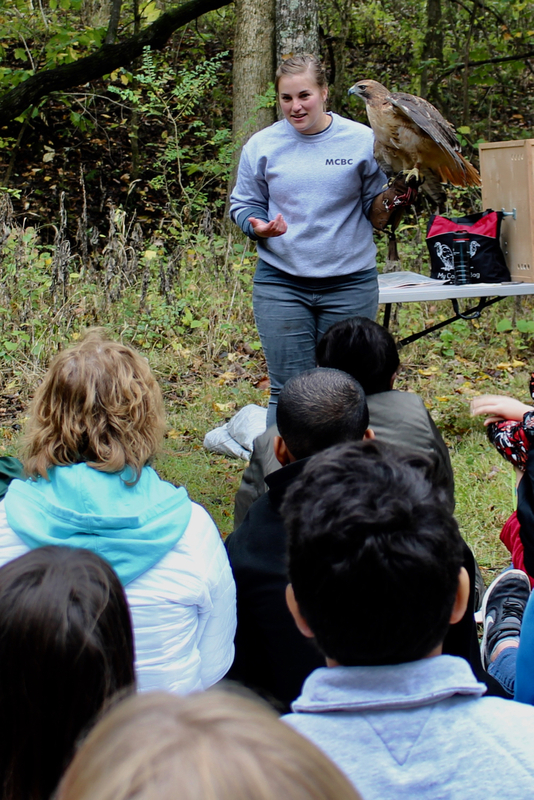 Remember, your donations help us maintain the Columbia Audubon Nature Sanctuary and continue to expand its prairie, host the outdoor field trip for more than 1,000 second-graders each year, and send teachers and students to nature-education programs. Columbia Audubon Society provides grants to teachers to attend “Sharing Nature: An Educator’s Week,” a program held each year at the national Hog Island Audubon Camp in Maine. They return to Columbia with fresh ideas for encouraging their students to appreciate and understand the beauty, complexity and importance of all of nature’s wonders. You can help us inspire more teachers by making a gift to Columbia Audubon Society at CoMoGives.com through Dec. 31. The next generation will thank you, and so will we! Columbia Audubon Society was honored by the City of Columbia this year for our work in habitat restoration at the Columbia Audubon Nature Sanctuary and for our community outreach and education programs. The award citation said— “…By providing a beautiful landscape for visitors and increasing native habitat for a variety of pollinators, they (CAS) have made a lasting impact on our community.” Columbia Audubon is an all-volunteer organization and takes on expensive projects, which wouldn’t get done without help from many partner organizations and generous contributors. Please consider supporting the Columbia Audubon Society and its work by making a donation at CoMoGives.com through Dec. 31. Ever seen a bird being banded for research? Well, Columbia Public School second graders have, thanks to the annual Band with Nature field trip sponsored by Columbia Audubon Society. Since the first Band With Nature field trip in 2012, nearly 6,000 Columbia students have had a chance to walk with their teachers into an outdoor classroom, complete with woods and prairie habitats, in the middle of our city. They visit study-stations at the Columbia Audubon Nature Sanctuary, learn about hawks and owls (and meet the real thing); watch live birds being banded; and explore the concepts of habitat, food and adaptations in animals. Please consider supporting the Columbia Audubon Society and its work by making a donation at www.CoMoGives.com through Dec. 31.